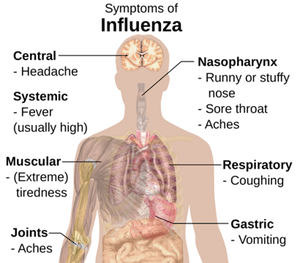 Influenza is an acute respiratory illness caused by flu viruses. There are 3 types of influenza viruses: A, B and C. Human Influenza A and B viruses are those that cause seasonal epidemics in winder months across the United States. Influenza A viruses are divided into subtypes based on two proteins on the surface of the virus; one of those is the H1N1 subtype which caused a national epidemic in the Spring of 2009, when the virus emerged to cause devastating illness, and death, to those affected1. Flu viruses enter the body through the mucas membranes of the nose, eyes or mouth, making the influenza virus extremely contagious. Influenza is very different from a cold. Onset of symptoms is usually abrupt with signs and symptoms of upper and/or lower respiratory tract involvement2. In addition, indications of systemic illness such as fever, headache, myalgia, and weakness can also be present3. As symptoms of influenza vary from person to person, influenza must be included in the differential diagnosis when influenza-like illness is present. Influenza-like illness is defined as fever (temperature of 100F or higher) coupled with cough and/or sore throat in the absence of a known cause other than influenza4. Most people affected with influenza will recover in a few days to less than two (2) weeks. Influenza can cause mild to severe illness. If allowed to progress and left untreated however, influenza can be a serious and potentially fatal condition. Complications of influenza include bronchitis, pneumonia, bacterial infection, respiratory failure, Acute Respiratory Distress Syndrom (ARDS), lung failure, mechanical ventilation, multi-system organ failure, prolonged hospitalizations, immobilization and immobilization-related issues such as joint contractures, and ultimately death. While anyone can get the flu, certain people are at a greater risk of developing serious flu-related complications if they get sick. This includes children five (5) years of age or less, adults sixty-five (65) years of age or older, and people with certain chronic medical conditions (eg. obesity, asthma, diabetes or heart disease)5. In addition, there are certain people who present with progressive, severe or complicated influenza. Progress illness is characterized by typical symptoms plus signs or symptoms, such as chest pain, poor oxygenation, severe dehydration, or other exacerbations of chronic conditions6. Severe or complicated illness is characterized by signs of lower respiratory tract disease, central nervous system findings, complications of hypotension, myocarditis or rhabdomyolysis, or invasive secondary bacterial infection7. When initiated promptly, treatment of influenza with anti-viral medications (Tamiflu, Relenza, etc.) can shorten the duration of symptoms, and reduce the severity and incidence of complications of the flu and flu associated death8. In otherwise healthy patients who are not at risk for developing complications of influenza, or who do not present with severe, progressive, or complicated illness, treatment with anti-viral therapy is most effective if administered within forty-eight (48) hours of symptom onset. In all other patients however, treatment with anti-viral therapy must be administered as soon as possible, regardless of time of symptom onset. Failure to timely diagnose and treat influenza may constitute medical malpractice. If you or a family member developed serious complications from influenza that was not timely diagnosed, please contact our firm to discuss your case with a New York Medical Malpractice Lawyer. 1 Recommendations of the Advisory Committee on Immunization Practices; Center for Disease Control and Prevention. January 21, 2011. 4 Recommendations of the Advisory Committee on Immunization Practices; Center for Disease Control and Prevention. January 21, 2011.